Up, up, and awaaaaaayyyy! 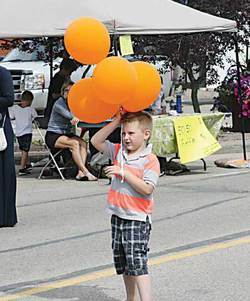 This young man looks like he is about to lift off with his fistful of orange balloons at Leduc's Main Street Festival. Leduc – Saturday dawned slightly overcast on Saturday, July 20th but the sun eventually came out and helped make it a day to remember at Leduc's Fourth Annual Main Street Festival. Beginning in 2009 the Main Street Festival has become a must attend event for city residents over the last four years. With sights, sounds, activities, and goodies enough to overload everyone's senses, this year's festival could only be called a smashing success. Vendors stalls and various displays packed both sides of Main Street (50th Ave.) in Leduc from 47 St. through to 50 St. with the entire length blocked off to vehicle traffic and pedestrians free to roam as they would up and down the avenue. Leduc Fire Services were once again well represented with several of the city's fantastic community minded firefighters on hand to show the kids (and a few extra large kids, nudge, nudge, wink, wink) the interior of one of their fire trucks, with a lucky few even getting to blow the horn. Two of the other big hits with the wee ones were the ever popular Thistle Hill petting zoo which was set up at the east end of the avenue, where everyone was welcome to go inside the fences and get up close and personal with some very friendly chickens, bunnies, and goats. And the most unique bouncy house/slide that I think has ever been seen at one of the festivals was set up nearer the western end of the festivities. It was in the shape of a mammoth sized alligator/dragon type creature with the kids entering through the giant maw boasting huge inflatable teeth and alternately sliding, crawling and bouncing their way through the body to emerge out the tail. Apparently the beast must have been a vegetarian because parents and bystanders alike were completely unafraid and thoroughly enjoying the sight of the kids climbing into the ferocious looking mouth. The outdoor Farmer's Market that takes place every Saturday at the Alexandra Arena joined forces with the Festival this year and some of the vendors moved three blocks north and set up shop along 50th Street. So along with BBQ'ed burgers, corn dogs and cotton candy festival goers could also find fresh vegetables and fruit to tempt their taste buds. Entertainment was constant along Main Street that day including costumed stilt walkers that towered above the crowd and were a favourite photo opportunity for everyone. The Great Balanzo kept the crowd in stitches with his comedic juggling act, seemingly rubberized facial expressions, and balancing tricks. Safire's Hoopapalooza Show was both amazing and beautiful to watch as she performed seemingly impossible tricks with hula hoops and manipulated a crystal ball in her hands in such a way as it appeared to float in the air as she simply moved her hands around it. It was a lot of fun at the end of her act as she got a few people from the crowd involved and tried to show them some hula hooping moves. Lets just say that there were a lot of laughs involved and some things are best left for the professionals. Balloons and ice cream cones seemed to be the most universally popular items on this beautiful day as everywhere you looked you could see cool balloon creations made by Russ' Balloon Adventure or some people simply hanging onto a cluster of multicoloured smile inducing orbs on the end of a string. A Chip Off The Crock Creamery was doing booming business on this hot afternoon with delicious full cream ice cream cones in numerous flavours flying out the door as fast as the servers could scoop them up. One of the tables that consistently drew the biggest crowds was the Tamarijn Exotics table owned and run by Doug Klooster. With beautiful live Boas and Corn Snakes draped around their necks, Crested Geckos leaping from gentle hands onto a more comfortable resting spot (for geckos anyway) latched onto the front of shirts, scorpions, tarantulas and creepy crawlies of all sorts, this display was extremely popular with all ages. Whether it was people who wanted to get up close and personal with the reptiles and insects, which they were able to do under careful supervision, or people testing their bravery with creatures that do not always engender warm, fuzzy feelings, this was one display that had a crowd surrounding their tables all day long. The gorgeous weather drew a huge crowd to the event and estimates showed that upwards of 1,000 people attended the Main Street Festival this year. The City deserves congratulations for putting on such a well run and well attended event and with successes like this it's only going to get bigger and better in the years to come!